Cold air (less than 60 degrees) may cause Raynaud’s attacks. People with Raynaud’s Disease may lessen the number and severity of attacks by avoiding colder environments, both inside and outside. They may wish to increase the temperature on the home thermostat or wear warmer clothing while indoors. For example, if reaching into the freezer causes an attack, wear mittens or gloves before opening the freezer door. If needing to go outdoors during colder weather, people with Raynaud’s should wear warm, protective clothing and consider layering. For detailed information regarding how to properly layer clothing along with excellent tips and pictures, click on Winter Survival Clothing System. Although most people with Raynaud’s experience symptoms in the hands and feet, other areas may also be affected. Mittens tend to keep fingers warmer than gloves. Heat packs may be placed in shoes, mittens, or pockets; however, seniors with poor circulation are at risk for burns when applying any type of heat to the skin and should check with a healthcare provider before using any type of heat source applied to the skin. Turn on the heater and let the car warm up before driving in colder weather. Participate in regular physical activities, such as walking or group exercise classes. Provide careful skin care for the hands and feet to prevent cracking and sores. Wear shoes that fit properly and avoid going barefoot. Avoid wearing items that might impair circulation, such as tight rings or bracelets. 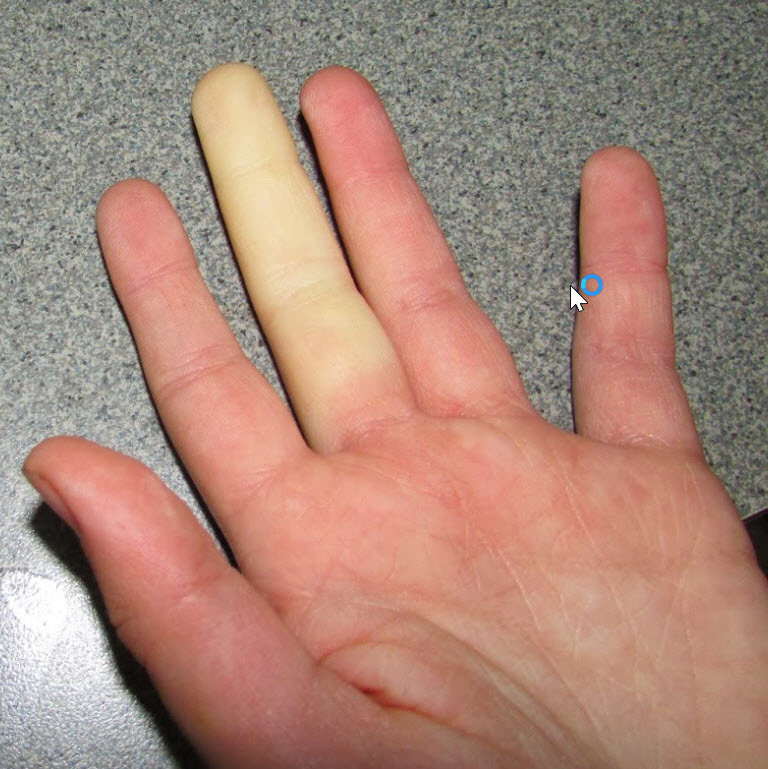 People with secondary Raynaud’s have a condition, such as systemic lupus erythematous (SLE), that is often associated with the resulting cold body areas. Proper treatment and control of symptoms of the primary condition combined with the practical tips above may be very helpful in controlling the Raynaud’s attacks without the use of medications. According to a Journal of Family Practice article by Heather Tagliarino et al entitled “What is the evaluation and treatment strategy for Raynaud’s Phenomenon?”, emotional stress may play a role in causing symptoms in Raynaud’s. Reducing stress through breathing exercises, yoga, progressive relaxation, and other stress reduction techniques may help lessen the number and severity of Raynaud’s attacks. Some medications may cause cold hands or other body areas associated with Raynaud’s. Before experimenting with any medication changes, always check with the prescribing healthcare provider first. Seniors tend to experience more side effects with medications and may be considered high risk for surgery, but those with Raynaud’s Phenomenon may find relief for symptoms by incorporating simple lifestyle changes and home remedies. Making healthy changes, such as smoking cessation, stress reduction, and regular exercise, may have the added benefit of improving overall health as well. This article is for informational purposes only and should not be considered medical advice. Always check with a healthcare provider regarding safe alternatives for treatment of Raynaud’s.